AirBnB seems to be the latest trend in booking accommodations (in the short term rental travel industry), offering accommodations to suit almost every type of budget (from cheap and moderate all the way to extravagant): hostels to guesthouses, homestays and even having the whole apartment to yourself. The experience that AirBnB offers is unlike a hotel, as it connects (ordinary) people (both guests and hosts) and enhances your stay experience by apparently connecting you to the locals and the local culture. While AirBnB offers accommodations from all over the world, I cannot attest to whether all the apartments that are available on AirBnB are good (and accurate), but I can say that the results for my accommodation(s) in Seoul (so far) have been good. 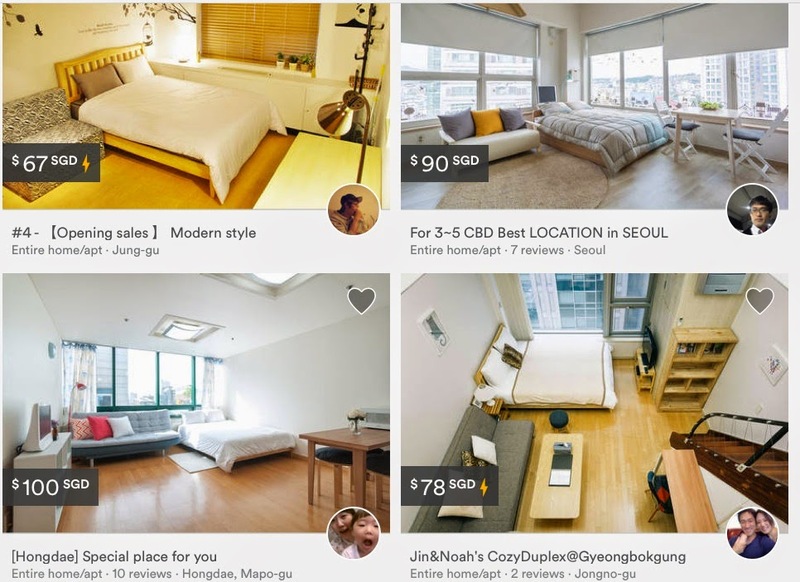 There are certain countries where I would prefer a hotel over AirBnB, but Seoul (South Korea) is one place where AirBnB would be the first place I would think to look for accommodation. Accommodation photos: Do note that the actual accommodation might be slightly different from the photos, so be prepared. But from my experience, the apartments in Seoul are pretty accurate (you really have to look carefully). Description of the listing: This pretty much sums up where the accommodation is located, how to get there, along with any nearby attractions (if any), what does the host provide (e.g. soap, shampoo, kitchen, shared bathroom, wifi egg, tv etc…). Do note that not all accommodations in Seoul have TVs or elevators, so if those are important to you, look at the listing very carefully. Reviews by other guests who have stayed: you need to take this one with a pinch of salt; basically see what some of the major grouses and compliments of the previous guests are, than decide whether you can live with it for the duration of your stay. Pricing: The pricing that you see before booking is not the final price. Enter in your preferred dates and the website/app will calculate for you the final price, which would include an AirBnB booking fee, cleaning fee and additional guest fee (if any). On average, expect to pay about S$70-150 per night depending on the rate (set by the host) and the number of people in your group. Of course, this estimate can decrease/increase depending on your selected accommodation type (e.g. hostel, guesthouse, homestay or entire apartment) and nightly rate. If you have not yet signed up for AirBnB and would like to try it out for your next holiday in Seoul (or any place else for that matter), do sign up here to get a discount of S$31(or about USD$25) off your first stay. 4. Before actually booking, do send a message to the host via the “contact me” button to check if your preferred dates are available (since some hosts list their space on other platforms as well) and ask all the questions you need to ask (e.g. transport/food options etc…). A good host usually replies within the day or faster with answers to your questions. Some hosts “offer instant booking” which essentially enables you to book and pay straight away (as long as the dates are available), while most hosts will have to approve your booking (within 24hrs). But the rule of thumb would be to contact the hosts first before making any sort of decision or booking, instant or otherwise. 5. After you have messaged the host, determined that their space is the place for you, happy with the final price and can live with the booking policy (e.g. for strict you will only get 50% of the payment back if you cancel 1 week before your arrival or be prepared to lose it all if you cannot meet it), just click on the “book it” or “instant book” button. If it is “book it”, do note that the host would have to accept your booking (offer) within 24 hours or else it would be void. And if it is the “instant book” option, the money will be deducted from your credit card (if you want to use a different credit card than the one you have stored with AirBnB, simple add in the new credit card number before hitting that “pay & confirm” button. 6. Look out for listings that mention security deposits, these deposits are usually (temporary) charged to your card (on file) only if the host has to claim damages from you (just like a hotel withholds an amount from your credit card for accidentals and returns it to you upon checkout). AirBnB would withhold this amount when you check-in (the day that you are supposed to arrive) and would usually return it when you check-out. So far there have been no incidents for my stays in Seoul and the deposit was rightfully deposited back. 7. Once you have confirmed your booking, message the host one final time to double confirm the booking and ask any other questions you may have. The details instructions of how to get to the location may be sent to you a week or so before your arrival date. While photos and descriptions (even reviews) may not be 100% accurate, they are usually not far off the mark. However, don’t get taken in by the price and/or pretty pictures alone, look at the fine print and ask the host questions (where appropriate) and make your decision based on the many factors mentioned above. Don’t be swayed by the ‘attractive’ price or pretty pictures alone. Only book the accommodation when you feel assured with the host and location of the accommodation (and its amenities), backed up by the reviews posted by previous guests (taken with a pinch of salt). Where are the photos to back up the current state of the accommodation? You mean all the reviews are stellar and everyone was happy? Why can’t we still sort out by order of dates or criteria (location, value, cleanliness etc…)? The AirBnB booking fee increases when you stay more days and/or have more people. When a host or guest cancels at the last minute, there will be an automated saying that the reservation has been cancelled *number of days* prior. However, it doesn’t specify WHO cancelled (was it the host or was it the guest?). It would be more useful to state who cancelled rather than a generic message that can be a little unnerving. Just remember, AirBnB is only a platform where hosts list their space for rent, so you (as a guest and the one staying) have to do your homework very carefully to (try to) ensure you have the optimum stay experience. AirBnB is merely a platform that connects hosts and guests, and charges you a fee for it.